Wedding Rings ... with a passion. Peter W Beck wedding ring. 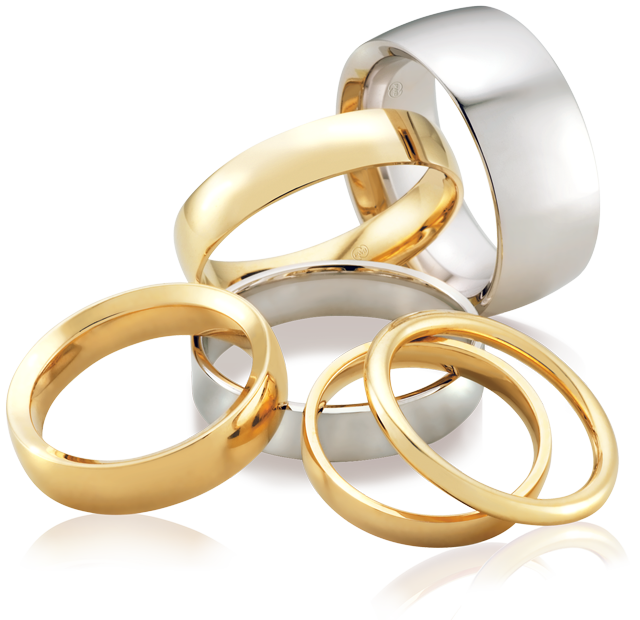 With three decades of precious metal knowledge blended by Australia’s leading precious metals technicians, you’re both assured of life long and heart felt world leading, Australian made quality. And that’s a promise. Our alloys are melted in a temperature and atmospherically controlled environment, which ensures the consistent quality of Peter W Beck metal. The molten gold then takes a cold bath in a vat where golden granules form. The traditional way involved dropping molten metal from two metres into a vessel of cold water. The same results, but without the quality control. Our little gold granules are melted again at a very precise temperature, before being poured into metal moulds, forming ingots. The gold ingot cools and hardens before leaving the mould. The gold ingot is then rolled out into its correct thickness as a flat plate. Interestingly, the roller pressure actually makes the metal much hotter and easier to work with. The pressure applied, when rolling the metal, changes the grain structure of the metal and increases its strength. Our very flat, gold ingot is now pressed into 'washer' shapes. Of course, the gold off cuts aren't thrown out. It's all remelted to create another ingot, more stamped washers... and, ultimately, more beautiful Peter W Beck rings. Each little washer is then pressed into a 'cone' shape. This next vital step ensures the seamless strength created in every Peter W Beck ring. The gold cone is pressed into the die, becoming what we call a 'slug'. We have just created the essence of a seamlessly and eternally strong Peter W Beck ring. Our gold 'slug' is then pressed to its required width, while also ensuring the new ring has precisely even sides and parallel edges. As soon as the ring 'slug' is even all around, it is now rolled and turned to the exact ring finger size. Peter W Beck rings don't just look amazing, they really fit. The outside profile and the inside of the ring gets an extremely accurate lathe turning, finessing the outside and inside of the ring to very specific degrees of comfort. What's more, you can choose from Peter W Beck's Standard Fit, Ezi-Fit or Luxury Fit styles. For all Peter W Beck's unique ring profiles and specialty pieces, a manual lathe is used to turn the ring's outside profile. The Peter W Beck hallmark. You'll find it on the inside of every one of our rings. It's the stamp of quality, and your guarantee for a lifetime. The carat stamp comes next, ensuring you are wearing a Peter W Beck ring of the finest metal in the country. Under the eyes of our professional jewellers, each and every Peter W Beck ring is now hand polished. The slightest imperfection is removed, accentuating the precious metal's natural luster. Immersed in an ultra sonic detergent, the ring emerges with any polishing residues removed. Then, after drying and a final quality inspection, another stunning Peter W Beck ring is ready to be dispatched... for a very lucky someone.